So there are many new products appearing on the market that are connected to the internet for no apparent reason, with hair curlers, fridges and, it could be argued, insecure IP CCTV cameras amongst them. 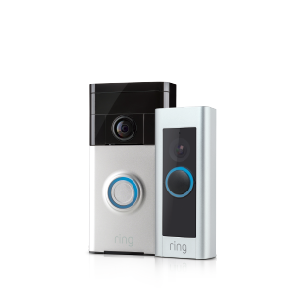 So when I was offered the RING video doorbell to trial, I thought, “Here we go!” In fairness though, at least this does have a sensible use case: You aren’t home, someone rings the doorbell, it films them for 30 seconds and lets you talk to them if you want, with the video stored on the Cloud. And of course, whether or not you are in, as long as the app is running on your phone, no-one can tell. It also has motion detection and various other options too, including possible integration with some of the new breed of home automation door locks. For the hard of hearing or those with a big house, there are also additional doorbells that can be placed around the house that repeat the ringer, and the phone can be set to vibrate as well as ring. There is also an option for WIFI security cameras (called the Stick Up Cam), floodlight and alarm units, and more, available on the RING website. I was slightly impressed when the first test worked perfectly. The 720p video seemed ok in regular room light, and I ended the call from my phone, a Samsung Note, which turned off the doorbell at the other end. Pressing the doorbell button again, however, didn’t work. In fact, it repeatedly didn’t work, and eventually, I gave up. I had a look at the desktop (web-based) access screen, and I could see the device was apparently fully charged (I had, indeed, charged it via the micro USB cable before starting) and the first video was there, but nothing after appeared. The next day I tried again, and still had mixed success. At this point, I reinitialised the RING to use a different, lower latency internet connection. This time, and for the last few days, it has worked reliably. So, be warned – satellite or 3g/4g network connections may not give the results you want. A relatively low-speed broadband ADSL connection at 2.5mbps, however, has been consistent and reliable. Next issue: Installation. Now the installation is easy, and yet complex. In theory, just screw the backplate to the door frame or wall with the 4 supplied screws, and then attach the camera to it with the two “high-security anti-theft” Torx fasteners. They supply a double ended screwdriver with the Phillips and Torx bits, so what could be easier, right? Except, on the three wooden doors I tried, the unit was too wide to either clear the stonework, miss the brickwork, or have all four screws in the substrate. It would likely be fine on a uPVC door, but I don’t have any of that new fangled plastic nonsense! Being battery powered, of course, it could be screwed to the middle of the door if you wanted to. But, you know… Batteries. On a WIFI video doorbell. Perhaps, being professionals, our customer would rather have something that didn’t require fiddling with tiny Torx screws, and have it hard wired into the power? So begins our next quest. Now, at first, you think this is very neat. You can take the power in from the existing doorbell’s transformer, as long as it runs on between 8 and 24V, but, and here’s the kicker, that has to be AC power. Now, my doorbell is powered by two DC batteries. It doesn’t have internet, so those batteries have lasted a good five years, so I don’t have an AC supply on hand. What I do have is CCTV and an alarm system, which like most access control systems, in turn, all run on what is the modern industry standard 12V DC. Which the RING apparently won’t work on. This is, basically, crazy. I mean, it charges off a 5V DC USB cable, and all the internals work on DC, likely at 3.3V if not 5, so there will be a circuit that handles the lithium battery charging and turning the 4.2 to 3V battery output into the power required for the camera, and yet, no, we are told DC won’t work. It is even in their website FAQ. Bizarre. So, to recap: The doorbell is too wide for many door frames where the power would be already, and it won’t work off DC. However, you will want to remove the old doorbell (on the outside at least) because if someone rings the wrong bell, you won’t get a notification. (Unless you’ve turned on the motion detection, but we will come to that shortly.) So, buyer beware. If the wall comes out further than the frame, you probably won’t get it fitted nicely where the doorbell was. Figure the labour to remove and patch the old bell into your quote if you have to mount the new RING unit somewhere else. Oh, and if you fit a new AC transformer, be aware you’ll need to add in a resistor, not supplied. That’s on their website too, but not in the box. Ok, back to the cool tech. Would I recommend it? I’m not sure. With a few tweaks, it would be a much better device. Allowing DC power, and making the unit slimmer so it fits UK door frames would be a start. However, if you are out a lot, and forever waiting for deliveries that could be stolen, well it will likely make your life a lot easier – you know when delivery was attempted (if they bother to ring the bell!) and, with the motion detection option checked, you’ll quite possibly know even if the courier only just managed to find the right house! At a cost of £159 on the RING website, it only has to stop one burglary or recover a couple of stolen parcels, and it will have been a wise investment. And, if you are burglarised, you will hopefully have a nice high-quality photo of their face from when they came to ring and see if you were in, before they put their mask on! I know that would be worth more than a few hundred pounds to me, and hopefully your customer would feel the same. The killer app, however, just might be that you can interface the RING with other IoT devices, which means that you can open your front door remotely, having seen who is at the door. Ideal for the bed-bound, or the rich, as you can let the cleaners in of a morning. (Other use cases are, no doubt possible!) Unfortunately, I didn’t have the time or resources to buy and test the 7 possible options for this, and how many of them are available in the UK I don’t know, but I imagine ERA will be actively working towards an offering for the UK market. Perhaps they could bring back the good old Locca in an IoT format? As a trading locksmith, the main issue is, where is the profit margin? With the unit costing just £159 inc VAT direct, and showing on the Duffells website at an RRP of £367.50 (£294 ex VAT), margins are beyond tight – you would need to buy at £127, a 56% discount just to match that price! – so you will only be making money from the labour of fitting. Once again, manufacturers are cutting out us middlemen! Given the ageing UK population however, who will be less able physically, these IoT products will definitely be a growing market even with tight margins, and no doubt we will be testing more “Internet Ready” products in future issues. Keep ’em peeled!